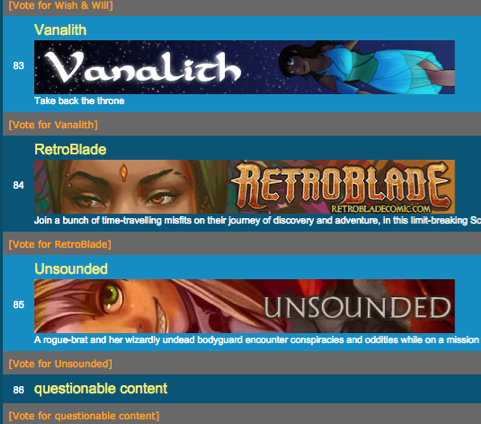 And what better time for a news blog update- than the anniversary of when the first page of RetroBlade went online? (Not counting the cover page in the archive dated 16th April, because that was backdated later on haha). This will probably be funded via a Kickstarter, so if any of you are interested in owning RetroBlade in print please do stay tuned for that later this year. (Backers will appear in a credits page in the book, and ofc our Patrons will be getting a discount!). So, what else has been happening these last few months? Um. Everything. More reviews. Some Interviews! Awesome new Fan Art in the Gallery!! And check this out! How epic is this art? (Can you spot Magnus? His glowy sword kinda helps ^^;). This image was created by the mighty 47ness, creator of the comic Sally Sprocket and Piston Pete. 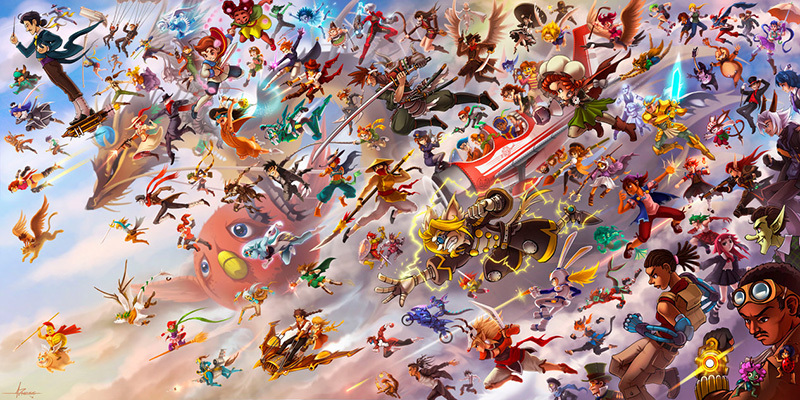 There are so many OCs in this epic piece, we couldn’t possibly list them all here! We’re just honoured to be among such great company! Follow this handy link for a comprehensive list (and a super high-resolution version of this image. I mean, really big. Huge.). This is so awesome and makes us incredibly happy. There are thousands of comics on there, some have been running for decades. Just, wow. A MASSIVE thank you to everyone who has voted for RetroBlade on TWC, and continues to. You are helping us to rise out of obscurity and find a larger audience! Today, TWC. Tomorrow, the WORLD. The comic area appearing over this blog was (finally) removed. A landing page has been added (This had the added benefit of fixing the previous bug as well, so wins all round). The Cast Page(s) have levelled up! There isn’t too much core structural stuff left to do on the website now. In general, I’d like to re-vamp the overall aesthetic design of the site and make it look a bit more modern and streamlined. I have some ideas for this, but it’s not top priority yet- content comes first! (Most images and concept art is being shared with Patrons first, some of it exclusively).